Here you find useful downloads for Supply Chain Day 2018. 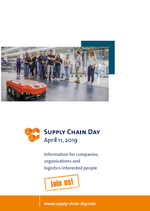 This brochure contains information for companies and organisationsin logistics about the Supply Chain Day on April 11, 2019. Feel free to use these for all material concerning Supply Chain Day 2017.